If you’ve been advised to “get a damp survey” or a “damp and timber report from a qualified PCA specialist”, then you’ve come to the right place. NEWS: Midlands consultant with London ambitions says £200 Survey too cheap, must be “scam”. PCA qualified surveyor and completely independent of contractors. Our only income is from damp surveying. Our only interest is accurate reporting of the root cause of dampness, risk to structural timber and cost of remedial treatment (if any). Damp is a problem in London where it rains most weeks of the year. Damp isn’t itself normally the problem, its the rot, mould, beetles, dust mites etc that feed on moist nutrients that cause the problems. The greatest concern for any property is rot, because it destroys structural timber. The biggest risk to a homebuyer is not correctly identifying the root cause of dampness. No amount of chemical damp proof treatment will help solve rot. 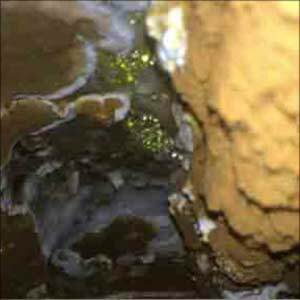 Dry rot is the most damaging result of damp. The image is of rot following mis-diagnoisis. Dry rot – serpula lacrymans (tears) – is common, pervasive, yet the tell tale signs and risks are so easily missed during damp surveys. Myth or reality? 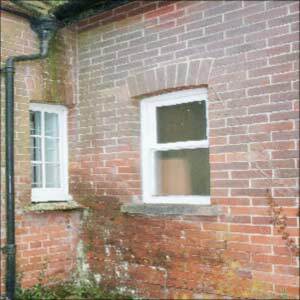 Well moisture can rise up by at least one course of bricks, but is that ever enough to cause dampness in a property? Not in London. Why avoid free or contractor surveys? Contractors maybe good builders, but they don’t give independent advice – they are looking for work, whether or not it is good for the property. Contractors don’t normally allocate sufficient time (or have the experience) to identify the true cause of damp, besides it isn’t in their interests to. Instead they recommend hiding damp behind an impermeable barrier, typically suggesting that there is rising damp. Rising damp is almost impossible in London as water is pumped out, so by definition, they are not diagnosing the actual source of damp. Inevitably the impermeable plaster will need replacing, and despite a guarantee, contractors will persuade owners to increase the area being treated, which costs more money to continue the wrong treatment. Impermeable plaster can hide the real risks of damp, such as dry rot, which will continuing to grow and cause extensive structural damage and danger. Taking the chemical approach will cost considerably more both short-term and long term. Most damp issues can be resolved very quickly and cheaply, such by reducing the height of the perimeter around the property, replacing damaged guttering, resolving internal or interstitial condensation etc. Damp Surveys Ltd was incorporated following development of breakthrough technology (patent pending) that accurately determines if a wall has Rising Damp. This development has allowed us to established beyond reasonable doubt that virtually NO London properties suffer from rising damp. By quickly eliminating Rising Damp as a potential cause of dampness, we can focus on the genuine root cause(s) of dampness, such as poor ventilation, excess humidity, leaks and other forms of penetrating damp. Damp proofing against rising damp, condensation, penetrating damp and leaking pipes is almost always free to solve if you use a Qualified Independent Experts. Call 0207 2741278 or email [email protected] for a free conversation.